Sweet Potato chat is one of my favorite go to recipes in summer when grill is out . 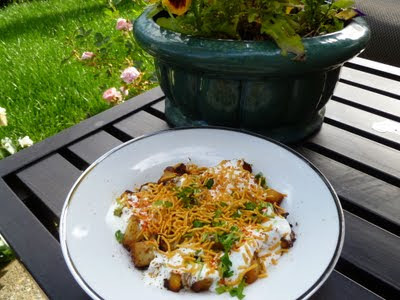 When cooked on the grill and the skin gets charred and imparts the potato a unique flavor which the makes the chat mouth watering.This works as a Vrat (fasting) food if you avoid the onion and sev in the recipe. Cook the sweet potato on grill till fork tender . Mix the onion,green chili and coriander leaves. Mix curd and salt and beat well. Peel the cooked potato and chop into cubes . Arrange potato cubes in the serving bowl. Pour the curd mixture over the potato cubes. Sprinkle the onion mixture over it . Next sprinkle cumin and red chili powder over it. Just before serving garnish it with sev and serve. wow, looks so delicious n yummy, very tempting one..
Yummy sweet potato chat..Am drooling over your pics! Delicious ~ tangy n tempting! Perfect and tempting chat.. Yummy !! new to your space...awesome recipe collection you have with nice presentation.. Delicious way to get the goodness of sweet potatoes. Chat looks so delicious and yummy,nice presentation. I really really want to taste this. This looks very tempting. Nice idea to consume sweet potato as chaat! Looks delicious! My favourite chat with sweet potato looks very delicious. Nice idea to use sweet potato for chaat book marking. Thanks for dropping by and for the lovely comments. 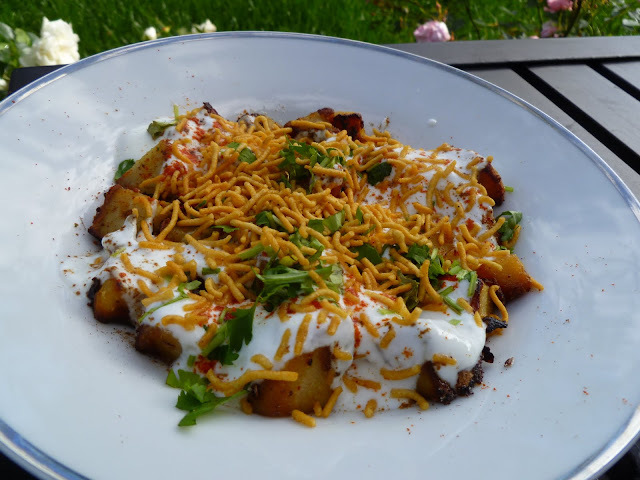 Happy to follow..
this chaat sounds so delicious! Hi Nisha, Thanks for leaving ur wonderful comments in my space dear..Nice twist by adding sweet potatoes..I like it..